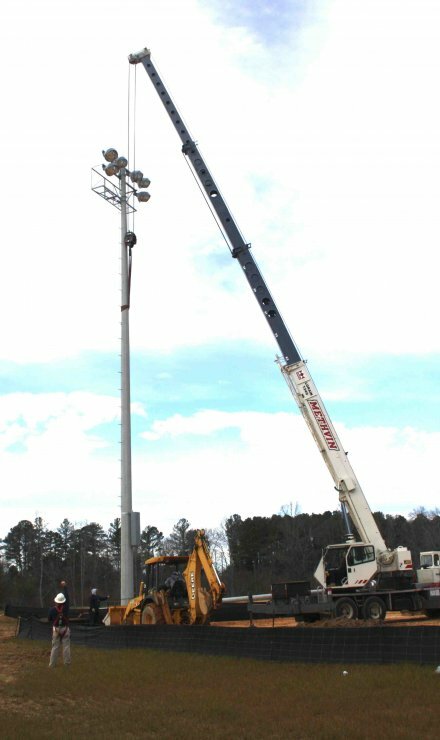 Workers began installing lights for the new Haleyville Sports Complex this week. Completion of the facility is still many months away. With the hopes of playing ball by fall, the installation of lights is a sure sign the park construction is well underway. Laying blocks for the concession stand should start next week. Planting grass and fencing are scheduled for this summer. It pays to plan ahead. The new Haleyville City Hall was constructed in part on top of the Storm Safe Room. The original construction of the Safe Room was designed and built with a plans to place a community center type building on top. With the offer from CVS to buy the old city hall and property, the current administration saw an opportunity to rebuild a new facility downtown utilizing the Safe Room as a partial foundation. The offices of the mayor, magistrate, clerk, and other administrative personnel are now located and operational from the new Haleyville City Hall located between 20th and 21st Street downtown. It took over two years in the planning and execution of selling the old city hall, fire station and property to CVS. Once the deal was made, the administrative offices as well as the police department moved and operated temporarily from the Neighborhood Facilities. Work on the final stages of the installation of communication equipment being done this week. That means the Police Department, including the dispatch office has not yet moved but should do so soon. A ribbon cutting and open house has not yet been planned. The Haleyville Board of Education met Tuesday evening for their regular monthly meeting. The Board approved the financial statements and boar expenditures for November, 2015 in the amount of $1,411,047.41 and for the month of December in the amount of $1,311,950.78. The 2016 baseball, fishing, softball and track schedules were approved along with revisions to the Cheerleader Handbook. The Board also approved use of the Haleyville Middle School Cafeteria for a chicken stew dinner on February 6. Three field trips and 10 fund raisers were approved. Amendments to the substitute bus drive list, substitute nurse list and substitute teach list were all approved. Under personnel, the Board approved a leave of absence request from Judy Melton until the end of this school year and the retirement of Suzanne H. Tyson as science teacher at the Haleyville Middle School effective at the end of this school year. Whitney Todd was hired to replace Tyson as science teacher at the Haleyville Middle School. The next scheduled Haleyville Board of Education will be Tuesday, 23 February. 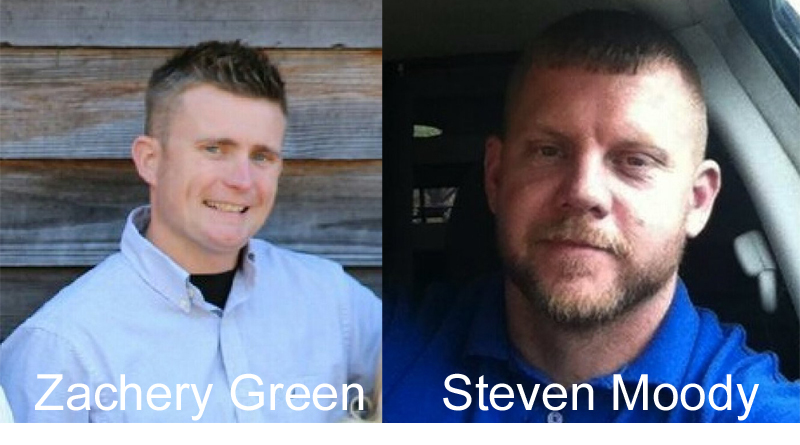 On November 30, 2015, Winston County Sheriff Hobby Walker terminated two of his investigators, Zachery Green and Steven Moody. Sheriff Walker said they had both started a security company and that it conflicted with their official duties. Walker explained, if there was an incident such as a theft at a house the two had under contract, neither could be utilized to conduct an investigation. Plus their job entailed being on call 24/7 and working another job would make that impractical. He stated he had instructed both Green and Moody to either terminate their company or resign from the Sheriff’s Department. Because they did not do either, Walker stated both were terminated because he felt he could not trust them to do as instructed. Green stated their company was not a “security” company and has never been portrayed as such. Sheriff Walker also stated since they both worked “at will” for the Sheriff, he did not need to provide due process because had the right to terminate anyone at will. Green and Moody retained an attorney and filed a Notice of Request for Grievance and/or Appeal to Personnel Board in December but there was no response to the notice. On January 13, 2016, a complaint was filed in the Circuit Court of Winston County alleging they were both denied due process on their termination. The two alleged wrongful termination as a result of an incident involving the Sheriff asking the two to commit an illegal act by furnishing the Sheriff with marijuana from evidence they had obtained for a drug case. The administrative offices of the City of Haleyville are now located in the new Haleyville City Hall building located just behind McDonald’s located between 20th and 21st Street. The move was made last Friday and after a couple of days to get things put away, all administrative offices are now open for business. The phone number remains the same, 486-3121, just the location has changed. A ribbon cutting and open house will be held later, once the police department has moved. The police department is still located in the Neighborhood Facilities for the present time where city court will be held Thursday. The Police Department is expected to move in February. Governor Robert Bentley announced Thursday that aid from the Federal Emergency Management Agency had been approved for 39 counties in Alabama to cover damage from the December 24-31 storms. Colbert, DeKalb, Franklin, Jackson, Lawrence, and Marshall in North Alabama were all approved. The Marshall County EMA Director estimates about $1.477 million in damage in their county with seven roads still closed. Jackson County is facing about $700,000 in damage. Lawrence County has about $500,000 in damage. In DeKalb County, they’ve got about $400,000 in flooding damage. Franklin County, about $300,000 in damages. Colbert County has about $220,000 in damage. The counties included in this declaration are Autauga, Barbour, Blount, Bullock, Butler, Chambers, Cherokee, Clay, Cleburne, Coffee, Colbert, Conecuh, Covington, Crenshaw, Cullman, Dale, DeKalb, Elmore, Escambia, Fayette, Franklin, Geneva, Henry, Houston, Jackson, Lamar, Lawrence, Lee, Lowndes, Macon, Marion, Marshall, Monroe, Pike, Perry, Russell, St Clair, Walker, and Winston. The disaster declaration makes local governments in the 39 Alabama counties eligible to apply for assistance. The grant provided by the Federal Emergency Management Agency may assist the impacted counties with debris removal, emergency protective measures, and the repair, replacement, or restoration of disaster-damaged, publicly owned facilities and the facilities of certain Private Non-Profit organizations. 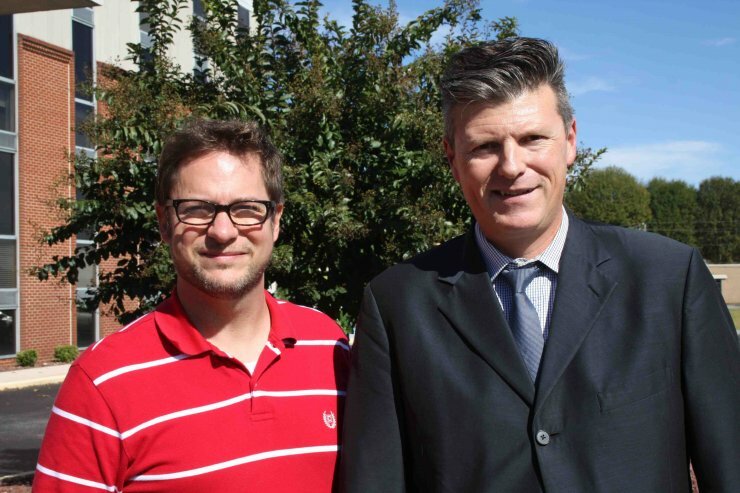 Haleyville Middle and High School Band directors Judd Williams and Regie Tolbert ask for your help. If you have a band instrument, no longer being used for whatever reason, please donate it to the school. Your donation will help some student who otherwise may not be able to afford an instrument. Trumpet, trombone, clarinet, flute or any other instrument you can donate will be put to good use. Please contact the Haleyville High School office at 486-3122, or simply drop off your donated instrument at the school office. Your donation will help clean out your closet and give that instrument a new life in the hands of a student musician. JOB QUALIFICATIONS: Must be physically fit, pass CPAT, and able to perform strenuous work in all types of weather. Must have a valid Alabama Drivers License. Preferred to have a minimum of one year of fire fighting experience. Must be over 21 years of age. Must be able to work different shifts. Must be able to graduate from a certified Fire Fighters College within 12 months of hire date and be certified by the State of Alabama as Firefighter I or above. Call 205-486-2435 for more information. The closing date for accepting applications is February 5, 2016 at 5:00 P.M. E.O.E. – A.D.O. Free volunteer tax preparation services will be available from the Winston County AARP Tax-Aide sites with locations in Double Springs and Haleyville, AL. Volunteers will prepare and electronically file federal and state tax returns for taxpayers with low and middle incomes. 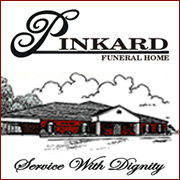 You do not have to be a member of AARP, a retiree, or a certain age to use this service. These tax sites were developed thru collaboration between the IRS, AARP Tax-Aide, Mayor Robinson of Double Springs and Mayor Sunseri of Haleyville, AL. Haleyville (Old 14th Avenue Elementary School – Chamber of Commerce conference room), at 2324 14th Avenue Suite B, tax preparation will be on Tuesday, February 9, March 8, and April 5 from 9:00 a.m. – 3:00p.m. 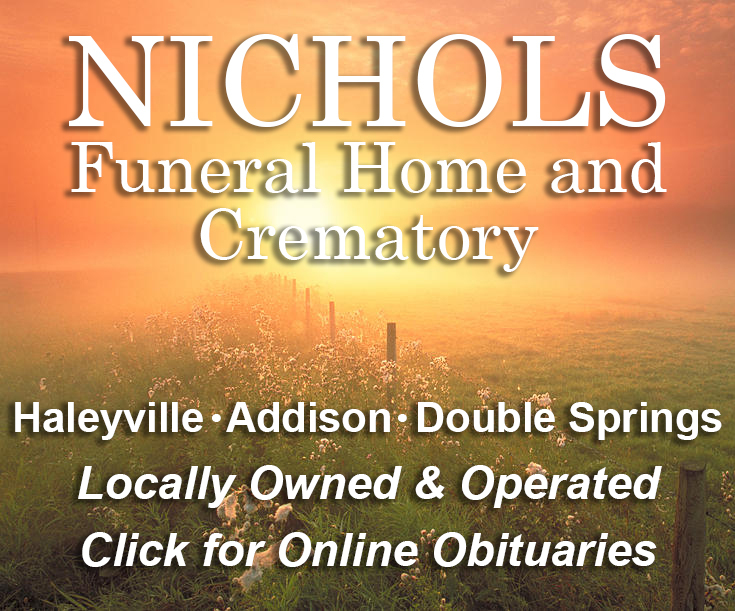 Double Springs (Town Hall courtroom) at 21 Main Street, tax preparation will beon Wednesday, February 10, March 9, and April 6 from 9:00 a. m. – 3:00 p.m.
Also, for those who live in the Arley area, Richard Carpenter, who volunteers with AARP Tax-Aide, will be preparing taxes in Arley. Contact Richard at 251-680-5638 for details. The Haleyville City Council met Tuesday evening with all members present. The council approved the minutes from the last council meeting on January 4 and the December general operation bills in the amount of $475,774.35. The council voted to approve a change in the alcoholic beverage ordinance changing the amount of the license fee to $2,500 from the original $5,000. An application was approved for a $150,000 grant from the Land and Water Conservation Fund for the new Haleyville Sports Complex. The council also voted to advertise for a full-time fireman to replace Tommy Lewis who will be retiring in April. A group of 20 individuals were at the council meeting to express their concurs on the use of the land next to the Knight Subdivision. A request was on the agenda for the last city council meeting to bring it into the city limits, but was tabled without further action. Members of the group stated they did not want any low income, or multi-family housing built on the property. So far, there has been no public proposal to develop the property in that manner. The next meeting of the Haleyville City Council will be Monday, February 1, 5:30 p.m. at the Neighborhood Facilities Building.